We are thrilled to share that we are officially launching our NYC DiB Chapter at the NYC Blockchain Center. This is going to be a fabulous event with unique content and an opportunity for networking with others who are committed to advancing our mission of empowering inclusive engagement with blockchain technology. Registration link will be available soon. 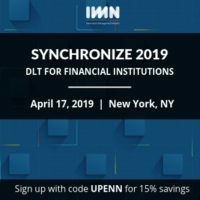 Diversity in Blockchain is proud to be an Event Supporter at Synchronize 2019. For more information please visit Synchronize 2019 Website. Diversity in Blockchain, in collaboration with Shearman & Sterling, held a sold out year-end event titled “Understanding Blockchain Smart Contracts.” The session was held in New York and featured a two-part program. 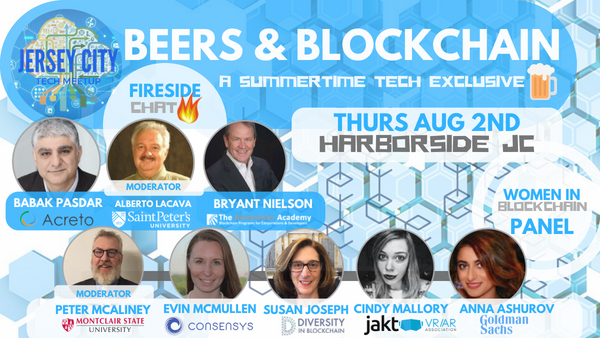 The Jersey City Tech Meetup Beers & Blockchain Summertime Tech Exclusive is an event that explores the future of blockchain enabled economies and how people can get involved. This meetup will feature a fireside chat with Babak Pasdar and Bryany Neilson, moderated by Alberto Lacava, followed by a powerhouse Women in Blockchain panel that includes Evin McMullen, Cindy Mallory and Diversity in Blockchain's very own Susan Joseph and Anna Ashurov. At the Blockchain for Impact Global Summit on June 4th, 2018, Blockchain for Impact (BFI) invites visionary industry stakeholders representing the full breadth of the blockchain ecosystem into a robust, future-based, multi-track global conversation about social innovation, fair and consistent public policy and responsible guidelines for industry governance. Blockchain Weekly is a regular series of LIVE interactive video chat forums covering issues, companies and thought leaders involved in fast markets. Tune into a special addition of Blockchain Weekly on Wednesday May 30th between 2-3PM (EST) to meet the founders of Diversity in Blockchain Inc. and to learn more about how the organization is shaping the blockchain sector. Pre-registration for this event is required through Shindig.com.